The Electro 5 by Nord represents the further expansion and refinement of a design platform that has been a stalwart of stage musicians for more than a decade. The Electro 5 provides a wide complement of piano, electric piano, organ and synth timbres with dozens of choices within each of those categories, all with a thrilling, robust presence and useful control features. Nord Electro is a natural choice for musicians in need of authentic emulations of classical electro mechanical and acoustic instruments in a portable and easy-to-use package. 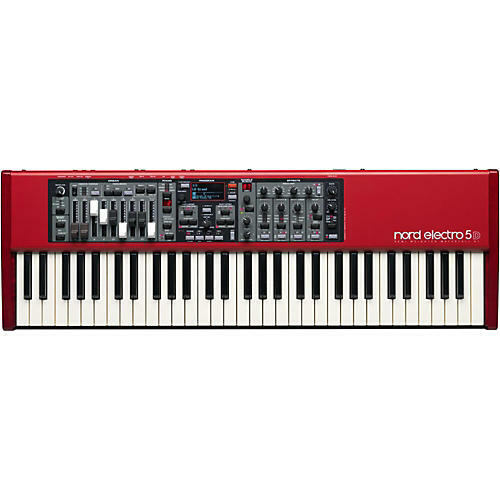 With greatly expanded memory, the added ability to split and layer and a live focused program section, the new Nord Electro 5 is a highly refined, focused yet flexible stage keyboard.This, the HP model, features Nord's amazingly portable weighted hammer action piano keys. Perfect for electric and acoustic piano sounds, but also works great for organ playing. This, an SW model, features semi-weighted organ type keys with a rounded "waterfall" tip, brilliant for rapid organ shredding and synthesizer licks, but also plays nice with piano sounds. Note: As of 2/1/17, Nord has announced a Software Update for its Stage, Electro and Piano lines. This software update includes a new OS for Nord Stage 2/2 EX, Nord Electro 5 and Nord Piano 3 that fixes a bug related to long release for synth pianos. Nord has also updated the Nord Sound Manager, adding support for Stage 2/2 EX with increased piano bank locations. Wurlitzers have been moved to E.Piano 1 bank (introduced with NS2/NS2EX OS v2.20). Download Update from Nord’s website. The Electro 5 Organ section features a new additional Principal Pipe Organ mode as well as the Tone Wheel simulation and the highly acclaimed Rotary Speaker simulation of a vintage 122 unit from the award-winning Nord C2D Combo Organ. This model features a physical drawbar set that can greatly enhance your organ playing. The C2D B3 Tone Wheel engine is the result of over a decade of perfecting tone wheel simulations, a journey that started with the original Nord Electro and followed by the award winning Nord C1 and Nord C2 Combo Organs. Not only has Nord analyzed the signals from each of the 91 spinning tone wheels inside several original instruments - they have also paid years of attention to each and every one of the intricate details that make up the characteristics of the actual sound in a vintage organ. A new B3 Tone Wheel Bass feature gives you the classic 16' and 8' bass drawbars in the left hand and can even be used with the Piano and Sample section for a thick and meaty bottom. The Farfisa* and Vox* models are just as impressive as the B3, simulating the behavior and unique response of the original instruments. The Farfisa Compact Deluxe, considered by many to be the mother of transistor organs, involves routing matrixes and complex filter combinations that offer a tailored sound with massive energy and high-end. The Vox* Continental's brute design brings you a more hollow tone, but with a very intense character. Both these transistor organs have their own unique, irreplaceable personalities. Combine them with any of the Amp simulations, add some distortion, adjust the EQ and they will definitely get you through any organ gig. The new Electro 5 series all feature 1GB of Piano Sample memory, allowing you to bring even more of Nord's unique sampled acoustic and electric pianos on stage. The subtle but effective Sympathetic String Resonance technology derived from the Nord Piano is now implemented in the Electro 5 delivering an unprecedented degree of realism to your performance when using Grand or Upright pianos. The entire Nord Piano Library is included on DVDs and new additions can be downloaded free on the Nord Piano Library page. Replacing the sounds is simply a matter of dragging and dropping files in the Nord Sound Manager for Mac and Windows. The Long Release feature is suitable for legato playing styles and the Advanced String Resonance feature on Grand and Upright Pianos can be turned off when desired. 4 Dynamic Response Curves are available for customizing the keyboard response to your playing style. Update: The new OS v1.30 features a number of bug fixes and improvements from the previous version. New units will ship with the new OS. Control pedal handling over MIDI has been improved, and rotor pedal operation has been improved to handle certain pedal types. Also, in Set list mode, drawbar Live could previously behave incorrectly when switching between organ programs. This update is recommended for all users and can be downloaded at Nord's website.